Anyone who lives on the lake will identify with this. Even when the water is up and takes away their beach they know the water will go down and there will again be wonderful sand beach. The lake is ever-changing offering a different view every day. The view can change hour by hour. Calm, glass-like water in the morning can change to menacing whitecaps by afternoon. Living on the lake can be relaxing. For some just a view of the lake is enough. The orange sunrise, and hearing the waves at night is bliss. Those will be happy with a home on a flagstone beach, a low bluff, or atop the tall limestone escarpment. Others must be on the sand. They want to soak up the sun. They want to play in the water. I must say, if I were to be on the lake it would have to be on the sugar sand of Lake Michigan. 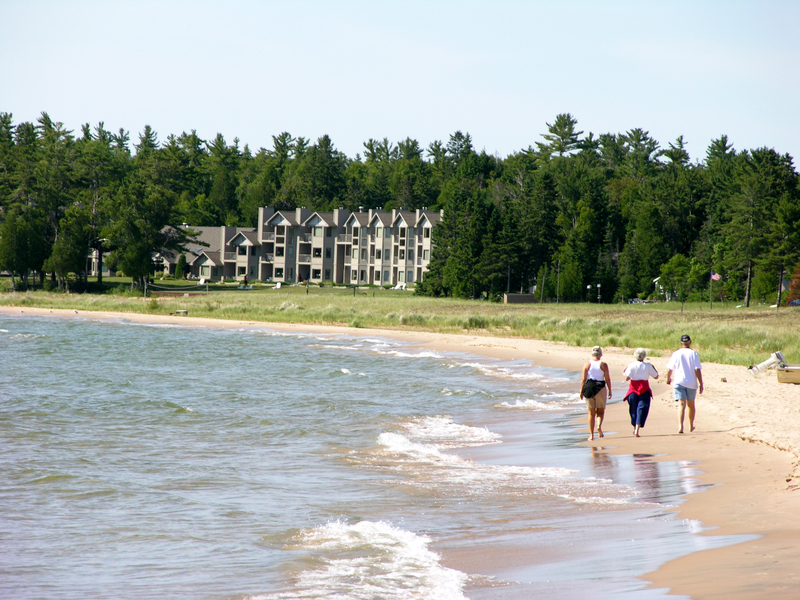 If you own a Lake Michigan shore lot, or have a house on the shore, and you are on sand beach you can likely walk along the shore for miles. One of those stretches is in Jacksonport. Your walk will be more beautiful and interesting than any typical trail. What better way to greet the day or get some exercise in the late afternoon than walking the beach. When walking the beach you do have to be considerate of your neighbor’s property. It is a general rule, that all parties agree to, that any shoreline that is submerged in water is owned by the state and accessible to the public. On March 30, 2019 the Chicago Tribune reported this regarding Wisconsin: “In Wisconsin private property stops at the natural high water mark and the state owns the land below this threshold. But beachfront owners have exclusive rights to the water’s edge, and the state Department of Natural Resources enforces a “keep your feet wet” policy for people walking on private beaches”. So again, be considerate of your neighbor, don’t intrude on their property, and you’re probably OK walking that shore for miles. A sand beach, or even a shelf rock beach is a wonderful place to have a picnic, read a book, or maybe actually jump in the water. If you have kids they’ll jump in for sure–it seems the lake is never too cold for them. Build a stone fire pit and gather around it at night to roast marshmallows and say goodnight to a wonderful day on the water. The lake is too unforgiving to have a port-a-pier or even a permanent dock, but you do have the opportunity to access the water with a kayak, canoe, or jet ski right off your own beach. A word of caution though, the lake can change in an instant so if taking a water toy out keep an eye on the weather, the condition of the water, and don’t stray too far from shore. Water is known to help relieve stress and help people relax. What could be better than after a long day to gaze out your window at the water, whether it smooth as glass or a stormy sea. Enjoy morning coffee on your deck and plan your day–which will include another visit to that deck to end the day! Living on Lake Michigan is a dream for some, a reality for others. Will you choose sugar sand, or a lot set atop the stately limestone bluff. Whichever you choose, there are some great homesites for sale on the lakeside.